Vinylcondition: as near as MINT!!! A record described as Mint should be absolutely as new, just as it came out of the factory and in truth, never have been played although this is often difficult to prove or disprove. The sound should be crystal clear with no background noise or deterioration in sound quality. The cover and any additional items such as posters,inner sleeve or lyric sheets should also be as new, with no creases, stains or writing(an acceptable exception would be the shopkeeper's hand-written price on the rear of the sleeve) which was commom-place in the 60's and 70's, before the days of bar-coding and automated pricing machines. This grading means that the record and/or it's cover are just marginally short of qualifying as being Mint. 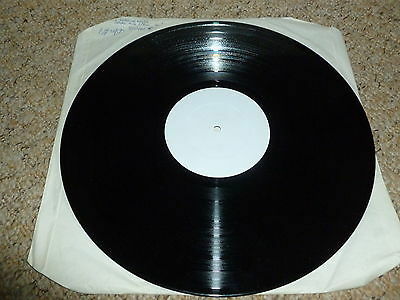 The vinyl may just show signs of having been played once or twice. The area around the spindle hole should be pretty much free of spindle trace marks, or at least only have the minimum ofthese marks.In other words, it is close to being Mint but not quite close enough to describe as such. There will be indications on the vinyl surface that the record has been played, possibly several times but at the same time, it has been well cared for. There should be very little deterioration in the listening experience. The sleeve/jacket could have minor creasing and/or signs of storage wear/discoloration, particularly on the back. EX- would indicate that the record would qualify for an EX grading apart from perhaps a small initial written on the label or sleeve or a scuff on the label or other very minor defect which does not affect the overall appearance or sound quality of the item. Returns Policy: 14 days from date of purchase to return the item. postage cost paid by the buyer. Item must be received before refund issued.